Casual contemporary queen suite features a bed with geometric upholstered headboard panels, plus triple dresser and matching mirror. Casual contemporary king suite features a bed with geometric upholstered headboard panels, plus triple dresser and matching mirror. 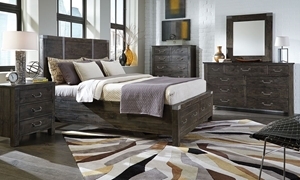 Transitional style solid wood bedroom in weathered charcoal finish includes king storage bed, 7-drawer dresser, and beveled portrait mirror. King storage bed with six full-extension drawers, matching dresser and mirror with reeded accents in an elegant dark cherry finish. King bedroom suite emanates old Hollywood glamour with its silver lacquered finish, shiny mirrored details and luxe tufted headboard. Warm, rustic king suite features a sleigh bed with two storage drawers and Lamp Assist touch lighting, plus 6-drawer dresser and mirror. Classic Louis Philippe-style bedroom includes king sleigh bed, 8-drawer dresser and mirror handcrafted from reclaimed mahogany. Classic Queen Anne styling gets an update with this upholstered twin bed, single dresser and mirror in an antique silver finish. Classic Queen Anne styling gets an update with this upholstered full size bed, single dresser and mirror in an antique silver finish. Take the guess work out of design by choosing a bedroom set that suits your taste and space. 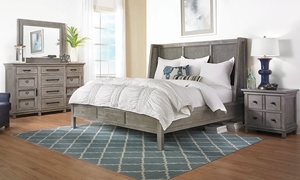 Here at Haynes Furniture, we have a beautiful variety of bedroom collections that include multiple pieces with the same design details.